South African scada developers, Adroit Technologies, and integration partner Robotic Innovations, joined forces in February 2008 to implement a robotic investment casting solution for CSIR’s Material Science and Manufacturing division. The CSIR Materials Science and Manufacturing (MSM) unit is situated in Pretoria and intends to improve industry competitiveness, national human resource development and quality of life for all South Africans through conducting leading research and innovation with partners and stakeholders in the fields of materials and manufacturing. The new titanium investment casting process is managed by Pierre Rossouw. After considerable consideration he contracted systems integrator, Robotic Innovations, to assist with the vision of broadening the range of possibilities for utilising light metals and alloys in automotive and aerospace applications. Any human or outside intervention in the process could cause a questionable result. This prompted the basic system architecture of a robot, PLC and Adroit Scada, to avoid these anomalies and ensure data accuracy. Robotic Innovations are specialist system integrators of Fanuc R2000 165F Robot with a reach of 2650 mm and a carrying capacity of 165 kg was used to transfer and manipulate the parts through the different processes and a Siemens S7 300 PLC was selected as the main control system. 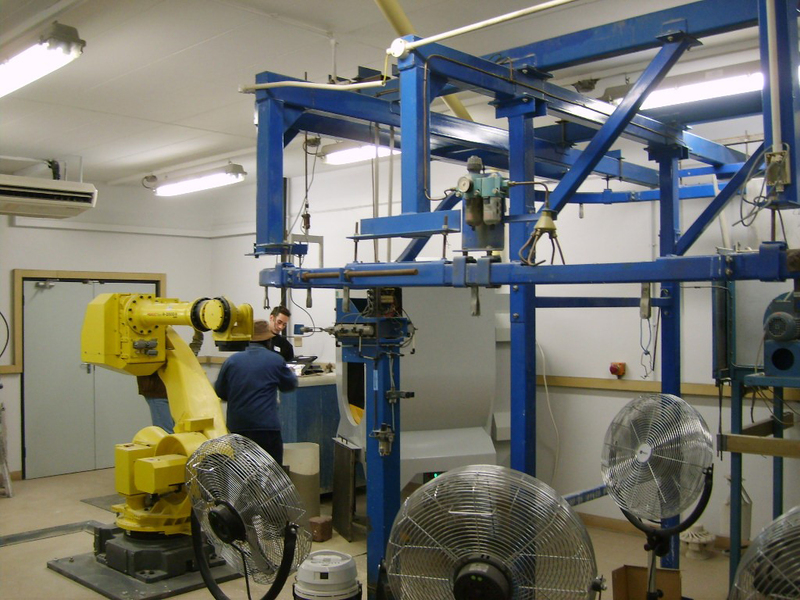 The function of the robot is to remove the wax moulds off a drying conveyor. These are then individually dipped into special slurry and placed into the rain sanders where the slurry is covered by sand, forming the first of many layers over the wax mould. Once this has been done the mould is placed back onto the drying conveyor for about 45 minutes. The cycle is then repeated, until the covering is thick enough to withstand the molten metals that will be poured into produce parts. Using Adroit Scada version 7 and running on Windows XP Professional, the system scans 75 Tags during each cycle. The alarms are active on screen and also via SMS, while trending is done via data and fault monitoring, which can then be stored on the system indefinitely. The monitoring is not only used to collect the data but also to calculate process costs and optimize parameter set-up for industry. This was considered essential as titanium is not easily acquired in South Africa and needs to be imported. This, coupled with the very strict qualification process of the CSIR, required the standard of the solution to be very high. Altus Mostert Managing director of Robotic Innovations, commented as follows on the choice of Adroit: “The Adroit Scada is efficient; it decreases downtime, reduces maintenance costs, it’s user friendly and there’s excellent local support. But what impressed us most, was the data monitoring and ways of use. Everything from temperature and humidity to weight and timing can be monitored; we were able to integrate 3D CAD designs seamlessly as mimics, giving the application an actual and realistic feel.